Here we will talk more specifically about organizing a bedroom closet. Again, you must do the basic closet organizing steps discussed on the previous page : declutter unused and old items and make sure you have good lighting. I will be assuming here that we will be using whatever structure currently exists in our bedroom closets. There are some great closet systems out there which we will discuss in more detail on another page. But for the time being let’s work with what we have, especially since the budget for that at the moment is a big fat zero!! Take what items you have left and group like items together, shirts, pants, dresses, etc. and within each group sort by general color. You may even want to group dressy clothes from your casual clothes, that’s up to you and what you actually own. 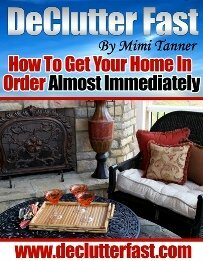 Clothing that is out of season can be stored away in a storage bag or box perhaps under a bed. This leaves you more working closet space for current items you wear. However, if you have the space, go ahead and put the out of season clothes off to one side of your closet. Get yourself some decent hangers to use… “no wire hangers!” Clothing simply hangs better and more uniform if the hangers are all of the same size and shape. And if you want to go a step further, make sure they’re all the same color. (I personally don’t like looking at a jumbled mess of hanger colors that have been collected over the years!.) 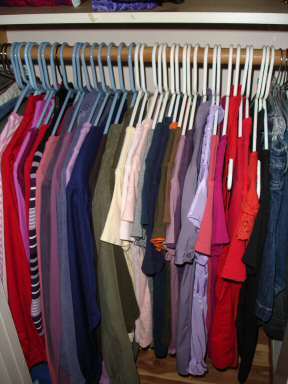 However, you could use hangers of different colors to color code your clothing (dresses on pink, casual shirts on red, dress shirts on blue) if that’s something that sounds of interest to you. Hang all your hangers in the same direction. Hang all your clothing items facing the same direction. That said, there are some items that can be worn a couple times before needing to be washed. After one wear, hang it back up with the hanger in the reverse direction so you can remember that it’s been worn once. Another method is to attach a little tag to the neck of the hanger made from an index card and a hole punch to let you know an item has been worn. Another reason you may want to hang some hangers backwards is to help you purge unworn clothing. If you wear an item turn the hanger in reverse. After 6 months to a year you’ll see what you do and don’t wear, making it easier to purge the items that no longer work for you. You may want to invest in some nice pant hangers if you have dress pants, in order to prevent creasing. Some nice sturdy wooden hangers are also important for items like leather jackets, etc. so they don’t get stretched or saggy. Where and how you organize your shoes depends a lot on how many you have and what kinds. 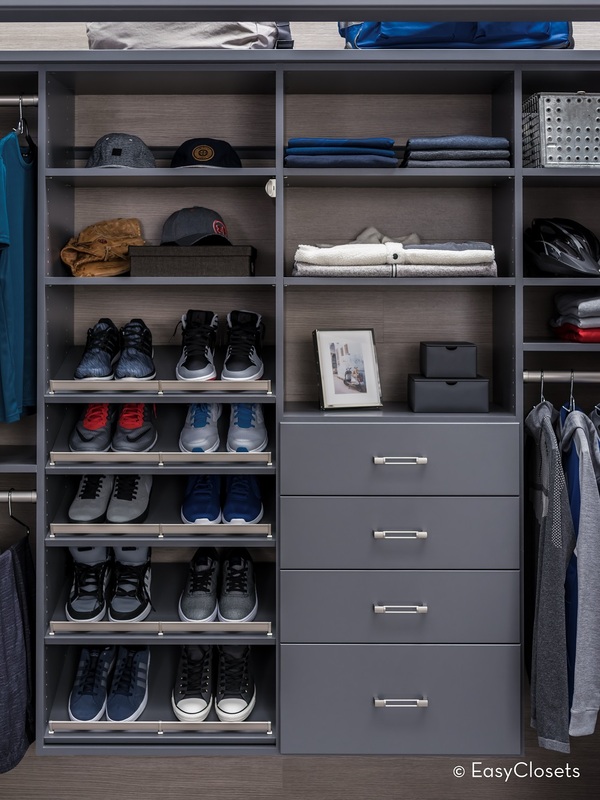 Assuming you don’t need an entire closet just for your shoes (like some characters on TV and I’m sure in real life) here are a couple ideas to store your shoes. Spreading them out on the bottom of the bedroom closet floor isn’t the best space saver. Instead, consider a hanging shoe organizer or a shoe rack to help you use that vertical space. It will also help put them closer to eye level. To read a detailed page specific to storing and organizing shoes, click here. If you have shelving in your bedroom closet, that’s great! You can store foldable items there such as sweaters, or jeans if you prefer to have them folded than on a hanger. If you have a large single shelf across the closet, you may benefit from decorative storage boxes which will help keep like items together instead of spreading out across the shelf. Not to mention, the boxes can add some nice color to your closet (who said it has to be a drab space?). Another alternative are wire dividers that slide onto a shelf to help keep stacks tidy and prevent them toppling over. Hooks are great for displaying items so you can more easily see them. They are also great for holding items that you use daily like a sweater or robe. Items great to hang include accessories such as purses, scarves, and necklaces. Smaller accessories may be hung in a jewelry organizer that hangs from a closet rod that has clear pockets. Having all of these items in your closet makes it easier to select something that goes with your outfits. These closet organizing tips should get your bedroom closets into good shape. I have to reiterate though how important step one is, to declutter!